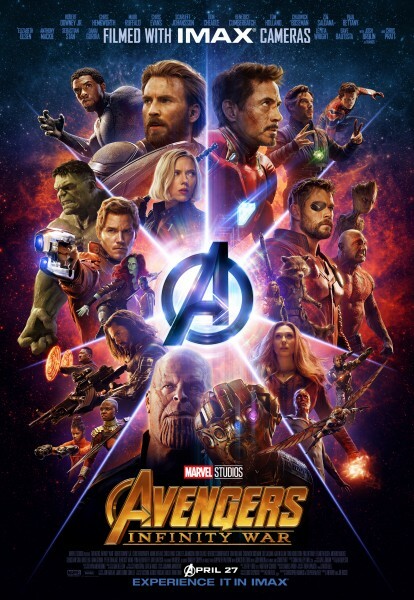 The entire Marvel Cinematic Universe comes together to combat a threat to the universe itself in Joe and Anthony Russo’s Avengers: Infinity War. Reviewing a film like this is a very difficult task because there has never really been a film like this. It isn’t a direct sequel to anything specific nor is it a stand alone film in its own right so it’s very difficult to discuss it in any sort of context outside of simply being a fan of this stuff. Readers of this site will know that I’m very much a fan of comic book movies and TV shows and become very invested in the worlds that are created as adaptations of my favourite characters on the printed page. The Marvel Cinematic Universe has very much been a dream come true for me as it’s a shared continuity featuring a varied cast of fascinating and colourful characters played by excellent actors starring in stories that largely feel as if they have leapt off the comic page. Even those who don’t like what Marvel have done have to appreciate what has been accomplished and the fact that it’s a juggernaut showing no signs of slowing down. Avengers: Infinity War is the culmination of a decade of storytelling and eighteen films of build-up. That statement isn’t quite accurate in terms of this film itself because it hasn’t been building towards this particular story since Iron Man in 2008 but it’s certainly true for the universe itself. Over the years it has steadily been growing by adding different characters and elements organically to create more depth as it goes. Infinity War is the culmination of all the work that went into building a universe by having it pay off in the biggest team up movie ever made. It’s an impressive undertaking and definitely a celebration of everything that has gone into making this work. What about the film though? I’m reluctant to go into any detail because it is something best experienced as blindly as possible. The trailers haven’t given much away -and in some cases have lied about certain elements- so there are still a lot of surprises to experience that would be better if they weren’t spoiled. In short, I thought it was great and delivered more than I expected in many ways. The most surprising thing is that this is very much the villain’s story. Thanos (Josh Brolin) is one of the best -if not the best, it’s too early to tell- villains these films have produced. Granted that’s not always a high bar but he definitely stands out among his peers in the Marvel Cinematic Universe and in comparison to great cinematic villains in general. Josh Brolin’s measured and often understated delivery is an excellent contrast to his intimidating stature and immense strength. There’s a softness to Thanos that allows for introspective exploration of his history as well as his motivations and lots of focus is given to his relationship with Zoe Saldana’s Gamora. Thanos’ motivation is simple, clear and makes sense from a certain point of view. There’s definite pathos to the character and time is taken to give him the depth required for a villain that has teased since 2012. This couldn’t be another forgettable villain like Malekith from Thor: The Dark World or Whiplash from Iron Man 2. After this much build-up failing to stick the landing on the villain would have been unforgivable but that doesn’t happen thanks to giving Thanos the necessary care and attention to make him the most formidable threat these characters have faced. None of this comes at the expense of the heroes though the film doesn’t spend any time introducing them to an audience that might be unfamiliar with them. A clear assumption is made that the audience have at least a basic idea of who these people are and they are expected to accept their contribution to the story. I can’t speak for someone coming into this having very little familiarity with the material but I’m inclined to think that enough information is delivered to make it workable. The actors certainly know their characters well enough for there to be no problems with the portrayal. The heroes are split into smaller groups which is definitely a good idea as there are simply too many characters to deal with to make anything else workable. A shared goal of defeating Thanos unites them in a common cause that takes place in vastly different locations. This also allows for characters who have never met before to interact for the first time and the results are excellent. Every member of the cast bounces off everyone else wonderfully and many of the more unconventional interactions are the most entertaining. Particular highlights are the Guardians of the Galaxy meeting Chris Hemsworth’s Thor and Peter Parker (Tom Holland) trying to be taken seriously among a group of older heroes. Ultimately the characters are why people keep coming back to this franchise and the film never loses sight of that. Narratively the film moves along at a confident pace that builds naturally as it goes. It’s a very dark story but not in an overpowering way thanks to the timely injection of humour throughout. Marvel films always have a comedic element to them and this outing is no exception. With so many funny actors on the screen it would be wasteful not to let them use their talents so thankfully they are put to good use. It isn’t all darkness and laughs either as time is taken to develop the characters in meaningful ways through the relationships they forge with one another. There is a good combination of pre-existing connections altered by the events of earlier films and brand new relationships that find their feet on their own. The action sequences are nothing short of spectacular. Those who fear the layers of sensory input brought to us by the modern blockbuster may find some of them somewhat jarring but there’s no denying that so much hard work and talent is put into bringing audiences super powered bouts like nothing that has been seen before. Different abilities are creatively combined to create some really cool moments and Thanos is consistently shown to be a brutal opponent. The smaller scale sequences are definitely the best as there’s a greater sense of the stakes involved but there was nothing that stood out as being especially weak as far as I’m concerned. A truly excellent cinematic experience marking the culmination of 18 films worth of development to reach this point. It features one of the best villains this franchise has seen, does right by the established hero characters that are depicted on screen, delivers spectacular action and never forgets that audiences keep coming back to this franchise for the characters. The film moves along at a very confident pace telling a dark story that is never overpowering thanks to injections of humour and lighten the mood throughout. Action sequences occasionally suffer from an abundance of sensory input making them difficult to follow at times but it’s far from a deal breaker. This is a true achievement that deserves to be experienced.